PanARMENIAN.Net - Who are the Udis? Besides being one of the oldest nations residing in the Caucasian Albania (stretching eastward from Kura River till Caucasus Mountains), the Udis are the only people who managed to survive through centuries and for some part retain Christianity as their religion, although many of them converted to Islam. The total number of Udis is about 10,000 people, who speak the Udi language belonging to the Lezgian language family. Part of them still live on their historic homeland – the villages of Nizh and Oghuz (called Vardashen before 1991) in the Gabala region of Azerbaijan; the others settled in Russia, Georgia, Ukraine. About 200 people reside in Tavush province of Armenia. This was the reason why the Udis were the victims of the Azerbaijani authorities’ violence in the 1980s, when the conflict with Armenians broke out. Many of them, both Udi- and Azeri-speaking, had to flee the persecution, leaving mostly for Russia. The relations between Armenians and Udis go back to the 4th century, when Christianity was proclaimed state religion in Armenia and Albania, the fatherland of Udis’ ancestors. From the very beginning the Armenian and Albanian churches had theological similarities and, eventually, they became completely identical. After the Arab invasions, some part of the Albania still remained Christian and was under the Armenian cultural and even political influence. In the course of centuries, however, the major part of Albanian tribes was assimilated, and only the Udis, being the parishioners of the Armenian church, preserved their Christian faith. As the nationality in Middle Ages was determined by religion, the Udis themselves, Armenians and foreigners perceived the Udi people as Armenian. Being Udi-speaking for most part in everyday life, they had a complete command of the Armenian language and used Armenian letters. The religious ceremonies were performed in Armenian. Moreover, many Udis had and still have Armenian names and surnames, Armenian schools, churches and gravestones with Armenian scripts. Beginning with the 11th century, when Georgia gained strength in the region, some Udis became Chalcedonic. 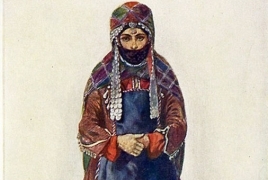 To differentiate between the Armenian Apostolic and Chalcedonic Udis, people referred to them as “Armenian Udi” and “Gyurji (Georgian) Udi”. Majority of Udis, however, converted to Islam and lost their native tongue. The most powerful wave of Islamization occurred in the 18th and 19th centuries. In 1905-1906 and 1918-1920, about 3,500 of 8,000 Udis were massacred along with Armenians. During the 1980s, there remained two Udi-speaking villages in Azerbaijan (Nizh and Vardashen) and three Azeri-speaking Christian villages populated by Udis. Currently, due to the assimilation policy pursued by the Azerbaijani leadership against the national minorities, the number of Udis is gradually decreasing. For example, before 1950s, Vardashen was mostly populated by Udis and Armenians. Now, there are less than 20 Udi families left. The total number of Udis living in Azerbaijan doesn’t exceed 4000. According to researchers, Azerbaijan is “reconstructing” the Udi-populated areas, pushing the people towards the Georgian Orthodox church instead of Armenian Apostolic. Armenian family names are being changed and articles denying any connection between Armenians and Udis are being published. In 2004, the Armenian scripts were rubbed off the Armenian church of Saint Yeghishe. Unfortunately, the close friends of Armenians have almost been forgotten. Those Azeri-speaking Udis, who moved to Noyemberyan region of Armenia in 1990s, didn’t get any support and had to leave for other countries, mostly Russia. Ethnographer Hranush Kharatyan, who conducted numerous researches on the issue, says that when the Udis arrived from the villages of Shaqi, Vardashen and Nizh in November-December 1988, the Noyemberyan regional secretary of the Communist Party of Armenia could not understand who these people and why they fled Azerbaijan. The problem was later resolved; however, the next year Azerbaijan sent negotiators who called on Udis to return. Many of the Azeri-speaking families, who were not welcomed by the Armenian population, agreed to go back. The others either stayed or migrated because of the grave social and economic conditions. Presently, the Udis living in the territory of Armenia don’t have a national minority status. The most famous Armenian Udi is general lieutenant of the Armenian army Movses Silikyan (1862-1937), a commander and Sardarapat battle hero. He was born in Vardashen village and was a parishioner of the Armenian church. According to sources, when he was arrested by the soviet authorities in 1935, he explained that he sometimes introduced himself as an Armenian, because many didn’t understand who Udis are. Another notable Armenian Udi was Sargis Kukunyan (1863-1913), a veteran of the Armenian liberation struggle. Kukunyan was born in Nizh village and studied in Etchmiadzin’s seminary and Saint Petersburg University. In 1890, he tried to cross into Western Armenia through Kars with a 107-member armed group but was held captive in a fight with Russian frontier guards and later deported. After a short release, he was arrested again and died in prison. Source: Hranush Kharatyan, Official ethno-demographical index in Azerbaijan in the context of search for and crisis of the Azerbaijani identity: the Udis, collapse of self-preservation attempts, Moscow, 2015. Thank you Yervant, This is new to me, I don't remember ever hearing of the Udi. Well I did hear the name before, but did not know much about them either!